Not since the days of the Monkey Island and Discworld point and click games have I played this genre with such interest as I have in the last year or so. Games like Richard & Alice, Technobabylon and Read Only Memories have reignited my enjoyment of them. 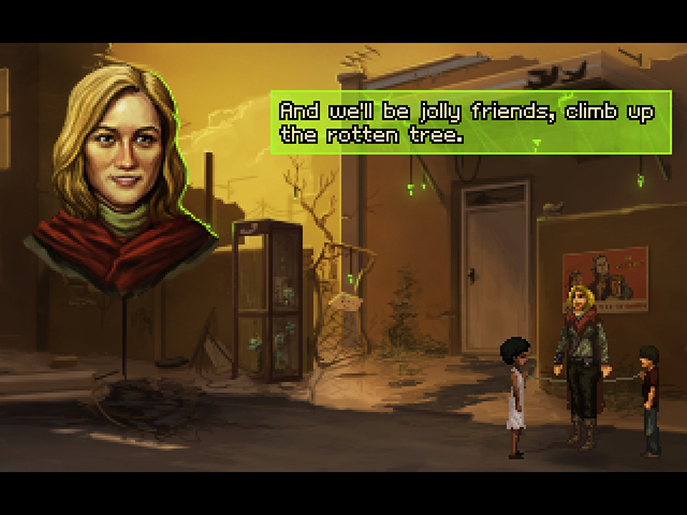 Wadjet Eye's latest, Shardlight, is a story about survival in a world that has been ravaged by war and destruction that was an absolute delight to play through. Set on the twentieth anniversary of the day the bombs dropped, you play as Amy Wellard, a twenty-five year old who is just trying to get by. She has recently contracted Green Lung, a plague-like illness that is quickly spreading across the population. The game begins with a lottery job – the aristocracy issue a job, the reward for successful completion is a lottery ticket. If your number is pulled you receive a dose of vaccine and delay the inevitable. 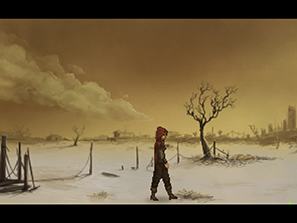 Shardlight wastes no time in introducing the kind of world Amy lives in. You need to repair a generator and discover the previous individual issued with the same job crushed under rubble. An uncomfortable mercy killing concludes this opening section showing Amy's characteristics – namely, doing what has to be done. It can be a harsh world, and you soon find yourself on the sides of both the Aristocracy and the rebellion. Mechanically, this is a pretty standard point and click adventure. You can look at objects/people and hear Amy's thoughts on them (though she appears to say some of these aloud, as characters sometimes respond) or click to interact or pick up an item. You store certain objects in your inventory, can combine objects with each other or use them on items in the scene. Amy has her trusted crossbow for the duration which is tremendously useful on many occasionans. Thankfully, the puzzles you encounter throughout the game are logical and can be solved using some thought and experimentation with your inventory. The only time I had problems was deciphering a message on a blackboard. 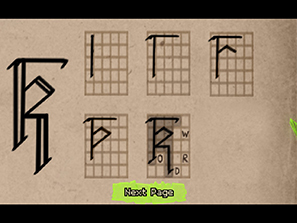 In fact, I solved it using a screenshot and photoshop before I could figure out how to do it in game. Amusingly, the item I needed to find was easy to get – I just had a mental block on the method to receive it. 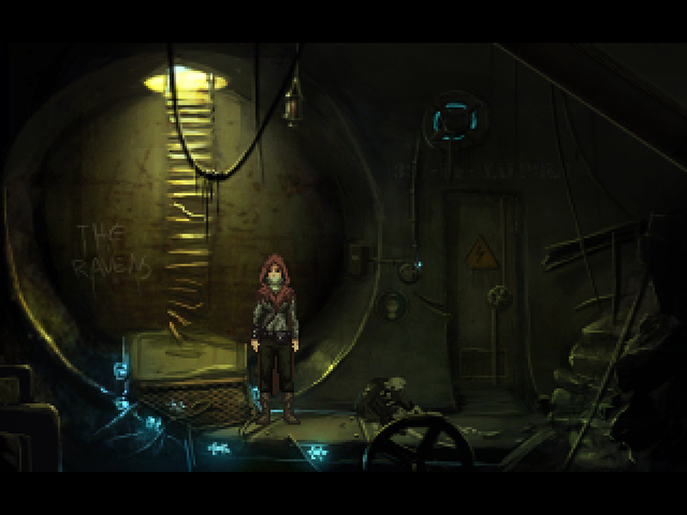 However, the main thing is that the puzzles in the game are fun to explore and solve. 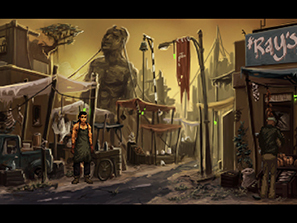 What made Shardlight stand out to me was the characterisation. The people in this world are scared, ill and doing whatever they can to get by. It gives the game a very human feeling, rather than turning immediately to violence and looting that you encounter in other games featuring the world as we know it destroyed. Amy has established friends before the game's beginning and you talk to them many times. The writing brings these characters to life. You'll meet a varied number of people during the game – from market sellers to the top of the Aristocracy. There is a cult devoted to the Reaper that welcome death but only from his hand that are interesting to investigate. Some people are doing whatever they can to survive the harsh city, some live in absolute luxury, some find solace in isolation. The number of different circumstances and conditions of people's lives you discover in a relatively small area help make the city feel alive. I felt everyone that I encountered had a justification for being, rather than a bland NPC in a game. The visuals in the game are a delight. Highly detailed pixel art goes hand-in-hand with the sombre, and fitting soundtrack to establish the atmosphere of the world. The art also ensured that objects that you could interact with weren't obscured or difficult to notice. The strong and focused aesthetic, especially the use of colour, represents a post-apocalyptic land and is consistent and considered throughout. With that said, Shardlight is a little rough around the edges and a few bugs persisted throughout my play through. The music would frequently repeat the same second several times when clicking on something to interact with and the game freezes slightly – I assume while loading in the animations. This was distracting at first but I became accustomed with it, though one shouldn't have to. Some of the voice work sounds a bit rough at times, mostly when a character is shouting – and at one point I swear I heard a different voice artist for Amy when looking at a certain item. That, or it was recorded at a different time in different conditions. One section of the game stood out from the rest, and not in a good way. There's a point at which you drink a concoction and fall into a lucid sleep-state. There you converse with the dead and are given the answer or hints towards major plot points the game had been building towards. This was bizarre as there is no contextual justification in this world of something of this nature existing or being possible. While the story-dump was interesting, it felt a little awkward and out of place. There's one other section that I have questions about that but writing about it would spoil much of the game. While the overall story is a somewhat familiar tale, the direction and events that happen in its duration are interesting, sometimes gut-wrenching with a rewarding reveal for each puzzle you solve. You'll feel for the characters you meet along the way and become engrossed thanks to the atmosphere the visuals and audio create. 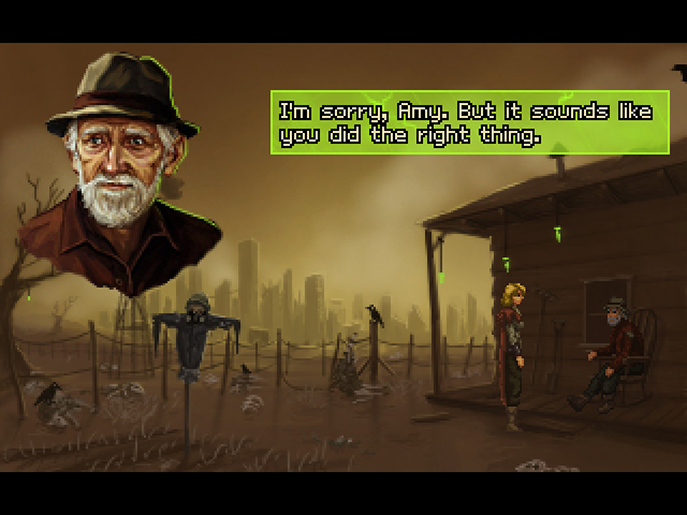 Whether you like point and click adventure games or just enjoy a great story, I'd highly recommend Shardlight. Alongside The Witness, Shardlight has been the most enjoyable game I've played so far this year.